I t was 1981 and prog was dead. ELP, Gentle Giant, Roxy Music, Yes, finito. And then the unthinkable happened. King Crimson, prog’s prodigal son, returned. Those who couldn’t imagine what the reaction to a Crimson King was like in 1969 got a taste of it with Discipline. The opening “Elephant Talk” introduced what seemed like a whole new lexicon of sound in Tony Levin’s undulating bass and Adrian Belew’s ululant guitar, Fripp’s meticulous mosaics and Bruford’s pristine paradiddling. On closer inspection, Discipline was the language of “I Zimbra” and Remain in Light refined. 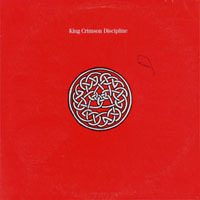 King Crimson the Second were more intellectual and exotic than Talking Heads; Fripp transported the experiment from the mad scientist’s lab to the QC clean room. In the lucid light and rarefied air, the music’s pungency was palpable. You didn’t simply listen to songs like “Matte Kudasai” and “The Sheltering Sky,” you smelled and tasted them. And despite the newness of the language, you felt familiar in these surroundings, like a dream remembered. 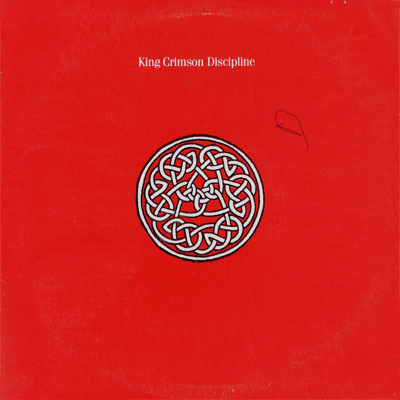 As I mentioned in an earlier review, I believe this is because Discipline feels like a culmination of everything Fripp was after, from Red to God Save The King/Under Heavy Manners. It is, in a word, perfection. And yet, like all Crimson albums, it’s a huge risk. Adrian Belew was an established stunt guitarist but as a singer he was largely an unknown (Levin likewise). The few cameos he had with Frank Zappa (“City of Tiny Lights”) hardly cried out for an encore. And yet his neurotic presence provides the Byrnian sensation that keeps Discipline from lapsing into (albeit brilliant) blandness. 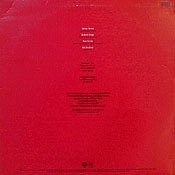 Once again, it was King Crimson who provided the decisive turn in the musical discourse. Prog wasn’t dead after all. It had evolved in the shadows and emerged straight-backed and shaven. Long live prog. Long live the king.